AMOS FOOK is the son of Edmond Fook and Elenor Stebins of Chittlehampton. In the third year of the reign of the last Stuart king, James II, the following baptism is recorded. A year later, William of Orange and his wife Mary, James II’s daughter, took over the throne in a bloodless revolution as James II fled the country. As far as we know, Amos was an only child, though not because his mother died in childbirth. We do not know the occupation of Amos’s father. Amos became a farmer, and he may have been following in his father’s footsteps. By the time of his marriage Amos had moved to the neighbouring parish of Filleigh. It lies on the Exeter-Barnstaple road, west of South Molton and immediately north of Chittlehampton. We do not know whether he moved as a child with his parents, or as an independent young man. The absence of siblings may mean that his father died when he was young. His mother lived on into her sixties, dying in 1727. During this time, Amos seems to have remained unmarried. They may have been left poor by his father’s early death, and Amos may have struggled to maintain himself and his mother. Amos was 39 when his mother died. He married eleven months later. In the hand of the Lord is the breath of all mankind. be a joyfull mother of children. Susan’s baptism has not been found in this register. There is, however, right at the beginning, evidence of a Bawman family in this parish. Roger Bawman was buried in 1685, the year the register began. There are baptisms for the children of William and Elizabeth Bawman in 1689 and 1691, a marriage for Abigail Bawman in 1696 and a burial for Abigail Bawman in 1696. The surname then disappears from the parish records. Susan is probably related to these people, but how is not certain, nor do we know at what age she came to live in Filleigh. Amos and Susan were married in the nearby town of South Molton by licence. This was necessary because neither of them was resident there. They had to go to Exeter to obtain the licence from the Bishop’s Court. They made a Marriage Allegation in the presence of witnesses, probably affirming their identity and that there was no impediment to their wedding. 1728 Fook, Amos of Philleigh, husbandman and Susannah Bawment of the same. Andrew Parramore of South Molton, carrier and John Parramore of the same, carrier. The Marriage Allegation is dated Oct. 11. The marriage licence was issued the same day. The information it contains is similar, but not identical. 1728 Fooke, Amos, of Philleigh, farmer, and Susanna Bawment of same, spinster. Oct 11. The terms ‘husbandman’ and ‘farmer’ appear here to be interchangeable. The wedding took place two days later. The couple returned to Filleigh to set up home. There are almost no houses around the present church, only scattered farms, of which Amos’s must have been one. Filleigh gets its name from Fili, one of the early British saints. He was a monk from Glastonbury, or possibly Wales, in the centuries following the Roman withdrawal from Britain. His fellow missionary Kea is remembered at nearby Landkey, and their two names also occur together in Cornwall. A llan is a typical Celtic monastic site, whose raised circular outline can often be detected in Westcountry churchyards. Fili’s original church was in the vicinity of Castle Hill, where a thousand years later, in 1684, shortly before Amos’s birth, the Fortescue family had built their stately home. St Fili’s would have been a small building, probably of wood or dry stone, holding not more than twenty people, with a small cemetery beside it and round about the beehive huts of the brethren. Surrounding the whole area was built a llan, a great earthen bank or ditch which symbolised the cutting off of the church from the world. History of the Parish Church of St Paul, Filleigh. Charles Layley. It was to a larger church on this ancient site that Amos and Susanna brought their first two sons to be baptised. Little Amos was buried Thursday Janry 29th 1730. The affidavit was sworn by Mary Harris. John was among the last children to be baptised in the medieval church. It appears that the building was not sufficiently large for its congregation. In 1730 the parishioners petitioned the Bishop of Exeter to grant a licence to Hugh Fortescue Lord Clinton to replace the existing church on the grounds that ‘it is so very strait and incommodious that there are not seats or room sufficient to receive with any convenience the number of inhabitants resorting thereto as they are duly bound to the Divine Service therein. The reason whereof there is great danger that the younger sort especially, if at all religiously disposed, may be misled to gad abroad and join with some tolerated separate congregation for Religious Worship (of which kind there is more than one in ye neighbourhood). And less orderly may take occasion to waste the Lord’s Day in Idleness or to profane it with disorderly or viscious courses.’ This eloquent appeal won the bishop’s approval – but there seems to have been another good reason. Lord Clinton’s father had earlier petitioned the bishop for leave to make a new entrance to the church as he was rebuilding the house. He did lay the foundation stone in 1725 but his son had much more ambitious plans and the church, which probably adjoined the present west wing of Castle Hill, would have interfered with the landscaping. So a new church was built, well away from the mansion, and consecrated by the Bishop of Exeter on 17 August 1732. The new church was a patchwork of architectural styles. 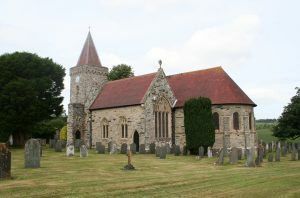 The porch and tower are Norman, with the addition of a spire, The nave is Middle English. There is a Romanesque chancel with an apse. And there are flamboyant Victorian tiles. The following year, Amos and Susanna’s first daughter was baptised in the new church. 1739 Simon the Son of Amos Fooke & Susanna his wife was Baptized Octr 8th. Mary was buried “in Woollen only” July 3d 1744. 1745 Baptized. Mary Daughter of Amos & Susanna Fooke. August 31st. At this time, an affidavit had to be sworn that a corpse was wrapped for burial only in woollen, to protect the declining wool trade. On March 4th and March 6th 1739, Anne the wife of John Treble of Northmolton and Lewis Curtis of Chittlehampton were buried in Filleigh. In both cases they were buried “ according to Law in Woollen only as was testified upon oath by Susanna Fuke before R: Bartlett, Rector of West Buckland.” Susanna was evidently the sort of reliable woman who could be called upon to lay out a dead body, and may have helped nurse the dying neighbour before that. Chittlehampton lies to the south of Filleigh and North Molton to the north-west, so this does not give any help with locating the Fooks’ farm. The parish of Filleigh seems to be have been served at different times by rectors from East or West Buckland, just to the north. The Fortescue family of Castle Hill were unusual in raising memorials at the church not only to their forbears but to some of their servants, including 101-year-old Philippa Colles, who died in 1749. No Fook memorials have been found. Amos and Susanna’s children may have been kept busy on the family farm, but it is quite possible that one or more of them worked for ‘the big house’ at some point. John had two daughters in Filleigh, Sarah and Johanna, in 1759 and 1763. Simon had one, Christian, in 1762. In 1775, thirty-year-old Mary Fook had a daughter Jenny out of wedlock. Amos had reached the good age of 83.